Cactus Flower Florists: Go Cards! What an exciting time to be an AZ Cardinals fan! We at Cactus Flower our proud of our hometown team and want to show our spirit with a gorgeous arrangement designed just for Super Bowl XLIII, available exclusively at Cactus Flower. Priced from $43, this arrangement makes a perfect centerpiece for the snacking table at your game day party, or a gift to that die-hard fan. The arrangement is designed with white hydrangea, red roses, red carnations and three miniature cardinals, and can be ordered with or without an AZ Cardinals mylar balloon. 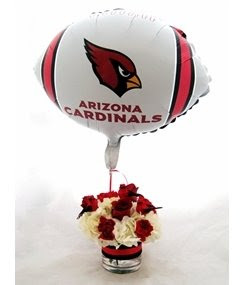 Order your AZ Cardinals arrangement today for delivery before the big game! Go Cards!